If you want to keep your body and hands well moisturized and looking beautiful the regular use of body lotion is a must. And when you combine it with cocoa butter…. You have the perfect combination to keep your skin looking soft, smooth, and youthful. This is why it’s such a popular base ingredient in quality lotions. But, there are a lot of different products available. How do you find the best one? In this article, we’ll show you our top-rated selections available on the market today. This lotion by Alaffia comes in an 8 oz bottle. Avocado seed extract and vanilla extract are packed with antioxidants that protect your skin from aging. Shea butter provides additional moisturization and soothes irritation. Palm kernel oil and glycerin moisturize and treat skin conditions such as eczema, dermatitis, and psoriasis. It’s a thick lotion and a small amount goes a long way. But, it absorbs very easily. It provides relief from dry and itchy skin and leaves it feeling silky and soft. And it’s suitable for fair skin and black skin. People report it successfully working to control skin conditions such as rosacea and eczema. It also works well on nails and can be used on your face. More expensive than other options. But this is because it uses all natural ingredients instead of synthetic chemicals. This product by NOW Solutions comes in an 8 oz squeezable tube. Aloe is moisturizing and soothing. It also has anti-aging properties. Sweet almond oil provides additional moisturization. It’s also a natural remedy for skin conditions such as eczema and psoriasis. And it contains skin-protective antioxidants. Vitamin E is a powerful antioxidant. It’s found naturally in your skin where it provides protection from UV light. Retinyl palmitate (vitamin A) encourages cellular rejuvenation and stimulates collagen production. 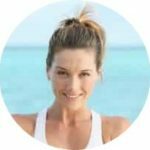 Which helps to reduce the appearance of lines and wrinkles. This lotion is not greasy or oily and is absorbed quickly and easily. It provides long-lasting moisturization and leaves your skin feeling smooth and soft. This lotion from Palmer’s comes in an 8.5 oz bottle with a pump lid. It’s made in the USA and is paraben free, hypoallergenic, and free of phthalates. Shea butter, coconut oil, sweet almond oil, and palm oil provide deep moisturization, powerful antioxidant protection, and soothe skin irritation. Centella asiatica extract hydrates, helps conditions like psoriasis, and improves photoaged skin by stimulating collagen synthesis. Scientific studies have also indicated that it might help to prevent the formation of stretch marks during pregnancy. This lotion moisturizes well leaving it feeling soft and smooth. It’s good for relieving dry and itchy skin and works well for soothing sunburn. Some people report success in using this body cream to reduce stretch marks. And for improving dark spots on the skin. It’s a nice smelling product that most people like, with the cocoa and coconut scent prominent. Advertised as being good for stretch marks. But, people report mixed results. This product by Burt’s Bees is advertised as being 98.9% natural without any parabens, phthalates, sulfates, or petrolatum. It provides long-lasting moisturization for up to 24 hrs and is great for leaving your skin feeling smoother and softer. Coconut oil hydrates the skin and has antibacterial properties. Sunflower seed oil provides essential fatty acids that help the skin to be soft and smooth. Grapeseed oil provides powerful antioxidants and moisturizes. Aloe barbadensis leaf juice to soothe and moisturize. Honey moisturizes, has antibacterial properties, and provides gentle exfoliation. Alba Botanica’s lotion contains ingredients that are 100% suitable for vegetarians. There are no parabens, synthetic fragrances, or phthalates used. And it’s animal cruelty-free. The combination of the tropical oils it contains are great for nourishing dry skin. They provide such a moisture retaining barrier that your skin almost feels water repellant on the outside with regular use. Aleurites moluccana seed oil soothes and provides antioxidants. Macadamia ternifolia seed oil acts as a moisturizer and softens. Jojoba oil soothes inflammation and moisturizes. This product from Jason is good for your body and hands. It’s absorbed quickly and provides long-lasting relief for dry and itchy skin. It’s well tolerated by most people with sensitive skin as it contains many soothing natural skincare ingredients. It also doesn’t contain phthalates, sulfates, or parabens. And it’s animal cruelty-free. This product from Ultimate Organics penetrates the skin quickly and easily without leaving a residue. It’s effective at smoothing rough and dry patches of skin such as heels, elbows, knees, and feet. The moisturizing effect lasts all day and helps the skin to have a shiny glow. Using this type of product regularly on your body, hands, and feet can have long-term benefits for your skin. A good lotion moisturizes effectively, leaving the skin looking and feeling soft and smooth. 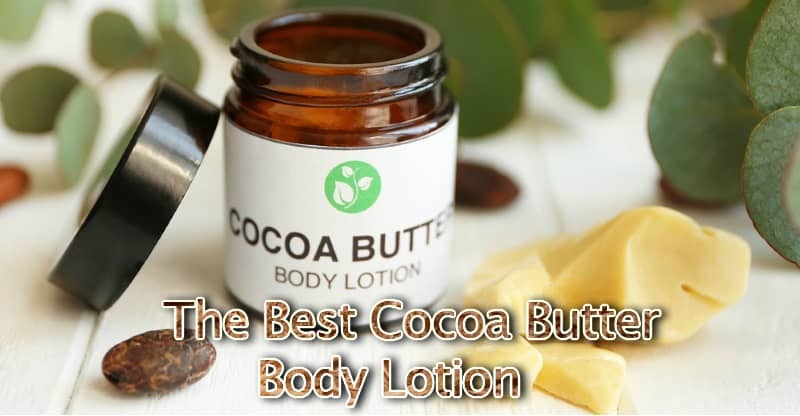 And cocoa butter lotion benefits also include anti-aging properties that protect the skin (1) and fight the visible signs of aging helping your skin to look more youthful (2). In our opinion, the best cocoa butter lotion is Alaffia. We really like all the natural ingredients it contains in preference to synthetic chemicals.